Photo by David Sirota. 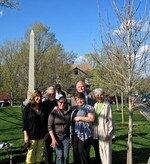 Cornwall Conservation Advisory Council member Kathi Ellick, Supervisor Kevin Quigley, Kate Goodspeed, Town Clerk Renata McGee, Councilman Randy Clark,and Sally Faith Dorfman-Sirota pose near newly-planted heritage maple tree by The Monument on Main Street. Photo by David Sirota. Cornwall Garden Club's Arbor Day planting of flowering magnolia at Sands-Ring Homestead with Councilman Al Mazzocca, Supervisor Kevin Quigley, and Chairperson Margaret Vatter. Photo by David Sirota. Kate Goodspeed, arborist, looks on as Supervisor Kevin Quigley officially proclaims Arbor Day at Cornwall Conservation Advisory Council event to maintain Tree City U.S.A. status for the Town of Cornwall. Photos of Arbor Day in Cornwall by David Sirota.